(AP) -- The CEO of AT&T Inc. on Thursday said the company will start "very aggressively" marketing smart phones based on Google Inc.'s Android software now that it will no longer be the exclusive carrier for Apple Inc.'s iPhone in the U.S. In effect, AT&T and Verizon Wireless are set to swap strategies in the high-stakes smart phone market. Subscribers of high-end smart phones pay roughly twice every month as much as people with regular phones. "We're going to be a heavy participant in the Android market this year, so you're going to see a significant shift in mix" of the phones sold by AT&T, Randall Stephenson told analysts on a conference call. Major makers of Android phones are Motorola Mobility Holdings Inc., Samsung Electronics Corp. and HTC Corp.
Shares of AT&T, which are part of the Dow Jones industrial average, fell 83 cents, or 2.9 percent, to $27.90 in late morning trading. The low number of new contracts demonstrated that even though AT&T activated a lot of iPhones - 4.1 million - the iconic phone has lost much of its power to attract customers from other carriers. In the fourth quarter, AT&T balanced the weakness in contracts somewhat by adding large numbers of other subscribers. It added a record 1.5 million "connected devices," a category that collects non-phone devices like Kindle e-book readers and Internet-enabled GPS units. AT&T is taking a lead in this area, but it earns much less per subscriber than it does for phones. AT&T also added 442,000 subscribers with tablets like the iPad. They generally don't sign contracts, and can drop their $30 monthly fees at any time. Tablets are a new category for wireless carriers, and Stephenson said they will help bolster results this year. However, most tablets are still sold without wireless service, and it's unclear how large of a role wireless carriers will play in the market. All told, AT&T added a record 2.8 million wireless subscribers, to reach 95.5 million. Verizon has 102.2 million subscribers, including "connected devices." Dallas-based AT&T posted net income of $1.09 billion, or 18 cents per share, for the October-December period. That was down 60 percent from $2.8 billion, or 46 cents per share, in the same period of 2009. Excluding items, chiefly due to the performance of its pension and health care plans for retirees, earnings were 55 cents per share, a penny above the average estimate of analysts polled by FactSet. Revenue was $31.4 billion, up 2.1 percent from a year ago. It was slightly short of analyst expectations at $31.5 billion. 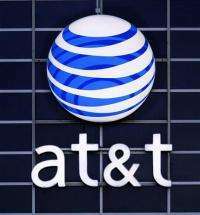 For 2011, AT&T said it expects earnings to grow in by a "mid-single digit" percentage or more from 2010 adjusted earnings of $2.22 per share. That points to earnings of at least $2.33 per share. Analysts expected $2.48 per share. Two weeks ago, AT&T Inc. announced a change to its accounting practices. It's now recognizing losses and gains in its plans that fund pensions and other retirement benefits, like health care, in the same year that they occur rather than amortizing them over time, as has been standard practice. For the fourth quarter, this meant that AT&T posted a $2.7 billion charge to reflect the performance of its pension plans and changes in assumptions on returns and benefits. It also allowed AT&T to adjust past earnings, reducing them to reflect the disastrous fund returns in 2008, when the financial crisis started. In effect, AT&T was able to move $17 billion in losses that would reduce future earnings to past periods.